When it comes to aging at home, we all want to live comfortably – all year round. Even though we’ve put our snow shovels away and don’t have to worry about icy sidewalks, summer does come with its own set of challenges. Whether in your house or in the great outdoors, we have a few tips to ensure you enjoy the season. With winter finally over, it’s time to put away your wool sweaters and bring out your cotton t-shirts; put away your snow blower and set up your patio furniture. It’s also a good time to take on bigger projects like decluttering your closets, basement and garage to make it easier for you to find things. It’s important to be careful when reaching up high or bending down low, especially if you suffer from joint pain. Don’t be afraid to ask for help when accessing hard-to-reach places or stowing away your belongings. Did you know that 20-30% of seniors experience one or more falls each year? Canadian winters may bring chilly challenges like ice and snow, but Canadian summers can sure make us sweat, and you may want to enjoy a nice, cool shower to beat the heat. Consider installing a grab bar in your shower or a nonslip mat in your bathtub to prevent falls. Also, when the summer sun finally sets, you might not realize how dark your hallways can get. Plug in night lights to ensure your path from room to room is well-lit. If you have hardwood flooring, get creative and use puff fabric paint give your slippers and socks more grip. When was the last time you had your HVAC system checked? Seniors are at a greater risk of getting sick from hot weather, so it’s important to avoid air conditioner breakdowns whenever possible. If you have central air conditioning, make sure to get the filter replaced every season, to ensure that the air in your home is low in dust and allergens. The Heating, Refrigeration and Air Conditioning Institute of Canada notes that maintaining your filter can cut down on repairs and increase the lifespan of HVAC equipment. If you use a window air conditioning unit, keep the surrounding area clean and free of dust so that it can circulate the air efficiently. 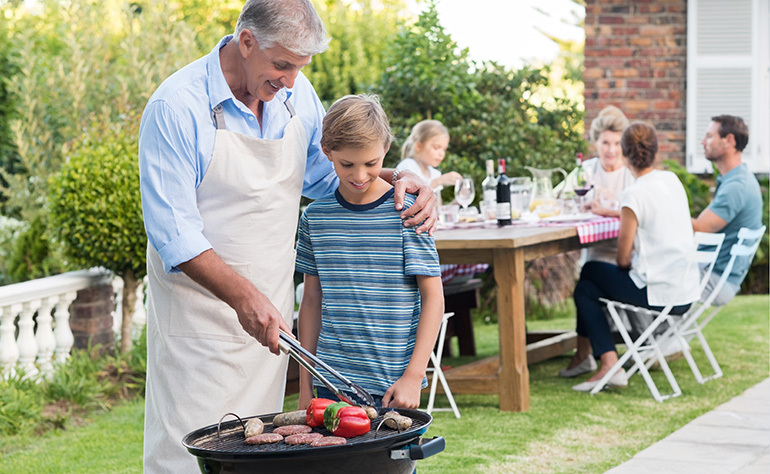 Clear skies, calm breezes, and the sound of laughter with your loved ones make for a great soundtrack to a barbecue cookout. Before you fire up your grill, barbecue maintenance is important to reduce the risk of a fire, especially on propane grills. Consider replacing the tank and inspect the barbeque valves and hoses every time you turn on the grill. Make sure your grilling utensils have long handles, to reduce the risk of burning yourself. If you’re hosting a get-together in the countryside or building a bonfire to roast marshmallows for your grandchildren, be wary of the fire risk that comes with hot, dry weather. Canada experiences approximately 8,000 wildfires a year, and most of them occur when the weather is warm. Warm weather always brings insects out of hiding. Health Canada identifies mosquitoes, blackflies and ticks to be the bugs that bite most frequently during Canadian summers. In particular, ticks are a growing cause of Lyme Disease in Canada. Conduct a tick check when you return inside from gardening, hiking or walking through tall grasses and brush. If you discover a tick on your body, carefully remove it using the proper method, or visit your doctor to reduce your risk of getting sick. Use insect repellant spray when you can; if your skin is sensitive to these products, you may want to try protective clothing, citronella candles or a clip-on repellant. To ease the itch of bug bites, products like aloe vera gel and calamine lotion are helpful to have on hand during mosquito season. If you are prescribed an Epipen for bee stings, make sure you take it with you before you go outside. If you are concerned about a bug bite, or you experience an unexpected reaction, visit your doctor as soon as possible. While summer usually means bright sunny days and warm temperatures, it can also bring some pretty severe weather like thunderstorms, lightning and strong winds. To help you plan the best days for summer outings, visit Accuweather.com and personalize the local weather forecast so you can always know if temperatures will set off allergies or trigger an asthma attack. With these safety tips, you can spend less time worrying and more time enjoying the summer with your family and friends. If you need an extra hand around your home to make it safe or tackle the bigger projects, we can help.